A ferrox! I can just defeat that! Close on the heels of Rune Age, we have finally had a play of a game set in the same world, which I’ve been wanting to play for some time now: Runebound. This is a fantasy adventure game, where heroes wander the land fighting bad guys and trying to be the first to defeat the Big Bad. It is often spoken of in similar terms to Talisman, though it is clearly less on rails and attempts to introduce a narrative which develops through play. Armed with a great bow and a dwarven fire mug, Red Scorpion fears nothing! There is a good selection of characters to choose from and Miss B chose the all-rounder Red Scorpion, who seems to go into battle wearing a +1 bikini of somehow-not-freezing-to-death. The rules are pretty straightforward, using a novel dice system for movement around the map and dice-plus-modifiers versus a target number for combat and other skill checks. Miss B mostly got her head around this, but needed constant reminders of what was going on in combat. She was, however, getting really into the decisions of what type of attack to launch each combat round and clearly enjoyed all the dice rolling. The real juice of the game happens when you move onto a space with an adventure token. You then draw a card of the appropriate colour (the adventures are colour coded according to difficulty so you can choose how much risk you want to take), which might be an interesting encounter, a world-affecting event, or a combat challenge which needs to be defeated (actually, you keep drawing and resolving cards until you reach a combat challenge). I rather like the event system as the cards do steadily develop a plot, making it feel that things are happening in a world that is heading towards a terrible cataclysm. I knew Runebound was likely to take a long time to play, so we had ensured that we had the whole afternoon available, had taken a “shorter game” option which meant that our characters would gain experience more quickly (though next time we’ll go even further with this — and I think starting with more gold should help make for a quicker start), and we’d decided that we’d finish when someone gained one dragon rune, instead of the rulebook-mandated three (or the defeat of the boss). In the event it still took well over three hours and we only just managed to get things rounded off by dinner time. Towards the end, Miss B got a bit of an injection of chutzpah and dove into the red (most difficult) adventure deck, which nearly ended up very badly. But thanks to judicious use of her Rule 17b counters (if you don’t know about that, Google is your friend) she managed to get through and defeat a dragon to gain the first of the dragon runes, which we ruled to be a victory for her. Given the length of the game, we scheduled a tea-and-snack break to allow us some time to recharge, but I was slightly surprised that this was the only break we needed (other than a few short toilet trips). The game held Miss B’s attention throughout and, although there were a few moments of frustration due to bad die rolls, etc., some Rule 17b counters dealt with that and all went well overall. I don’t think we’ll be playing this very often in the near future, purely because of the length of the game, but we definitely will when the time is available. And in comparison with Talisman? I’d definitely prefer Runebound. I think Miss B is torn, though likes the characters in Runebound more. The game: Runebound (Fantasy Flight Games), 1 to 6 players aged 14+. For some time now, Miss B has been eyeing up the copy of Rune Age with a mix of expressed feelings. At first it was terror at the picture of the undead necromancer on one side of the box, but more recently this mutated into interest, and then near-obsession with the picture of an elf on another side. Eventually she managed to persuade me to get the game out so she could try it. The last demon card is claimed! Rune Age is another flavour of deck building card game, but here there are a small number of shared cards that you can acquire along with a few more specific to your faction — and everyone plays a different faction, which all work in very different ways. Furthermore, there are effectively three currencies: gold, influence, and military strength, each of which can buy certain cards, many of which provide a different kind of resource. Another little quirk (some would say major selling point) of Rune Age is that in the basic set there are four different scenarios to choose from, and these set objectives so that the game could be a pure cooperative game (well, almost — one event card gives an option for a solo victory) at one extreme, or a full-on last-man-standing war. Miss B chose the competitive scenario where the aim is to be the player to defeat the big bad boss monster and which allows, but does not require, attacks between players. This scenario also has events which cause damage to players after a few turns, so that’s a big incentive to get yourself in gear and go for the win, as it is entirely possible that everyone will lose. It took a little while for Miss B to get the hang of things, but she got into making reasonable decisions after a few turns, though neither of us really ended up with particularly efficient decks. As we usually do with deck building games, we generally put our cards on the table during our turn and played them from there, which meant that if necessary I could offer advice to Miss B. This was needed a few times as she hadn’t yet developed a feel for combos in this game. We did attack each other a little bit to steal cities, and this didn’t prove to be a problem. Eventually we got to the point where we were attempting to defeat the boss dragon, and after an attempt each and some nasty events (which, when you get to the endgame, start recycling scarily fast), it was looking like we would both lose. Miss B was launching her do-or-die attack (I, having failed in the previous turn, would not have survived long enough to have another go myself) and needed a good draw from her deck. Now this is one of those rare points where I “tweaked” probability a bit. I figured she had about a one-in-three chance of drawing one of the cards she needed, so when I reshuffled her deck for her (I generally do the shuffles at the moment to speed things up) I ensured there was something decent on top. I’m not sure if I did the right thing there, as it may have been a worthwhile experience for us to both lose. But it made for some good excitement as she was still relying on a not-awful die roll to seal the deal. So that was a win for Miss B.
I think Rune Age is a little fiddly to be playing with Miss B, largely due to the levels of indirection brought about by the currencies, but if she wants to play again, that’s fine by me. 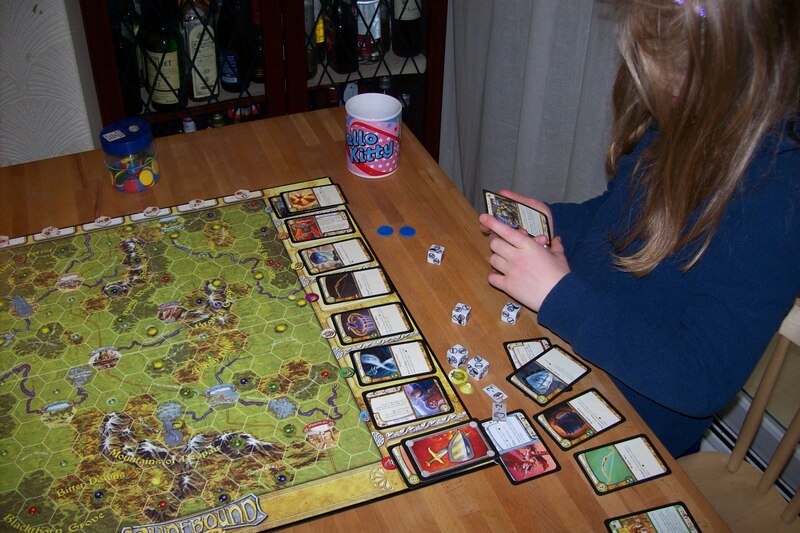 The game: Rune Age (Fantasy Flight Games), 1 to 4 players aged 13+. But penguins can swim. Why don’t they just swim? 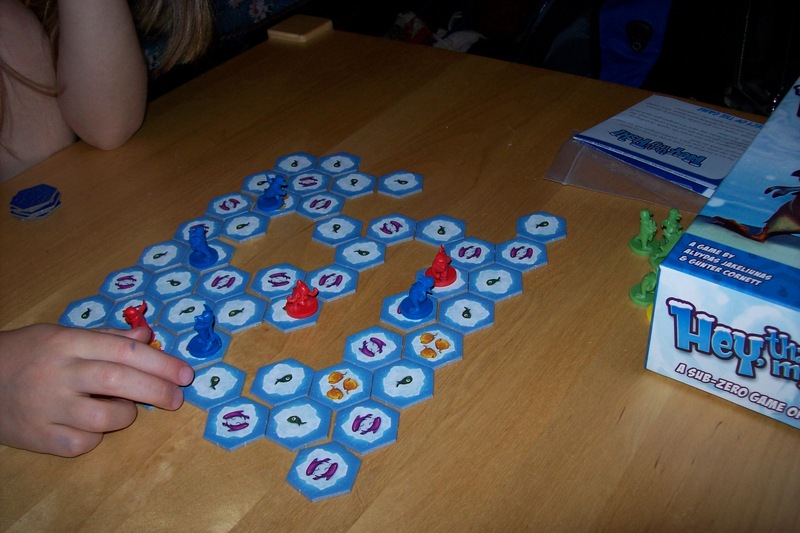 A cute little game is Hey, That’s My Fish!, with tiles depicting fish piled up on ice floes, and little model penguins who run and slide around the place collecting the fish. Who could resist that? Not me, anyway. The blue penguins seem to have more space but it’s slippery stuff, this ice. So the big thing in the game is as you collect fish, you remove the tiles (and add them to your score pile), so the playing area gets steadily eaten away and the options for each penguin get reduced. You have four penguins each in a two player game (this goes down to three or two in three and four player games respectively). So you can get them to team up to gather the most fish while trying to isolate the opponents. We played this for a few turns, then realised that (a) Miss B hadn’t initially understood what she was doing and had got herself into a tight spot (not a fun place to be on your first game), and (b) that I had forgotten that penguins could move more than one space at a time. I’m quite happy to call a do-over after a few turns of learning a game, so we reset the tiles and started again and had a pretty decent game of it. We weren’t far into the game when Miss B pointed out the thematic slip from the designer of the game: penguins are very fine swimmers and can jump out of the water, so if they get stuck on an ice floe, why don’t they just swim to another one. The only answer I could think of was that perhaps the penguins have agreed that these are the rules of the game and they don’t mind. Either that or there’s an orca ready to nab any penguin on a small enough bit of ice — though that doesn’t really work with the fact that you keep the fish you have gathered to that point. Still, this is an issue that Miss B hasn’t quite been able to let go of, so it just goes to show that even a fun game (and this is a good, fun game) can really come a-cropper if there is a thematic howler in there. 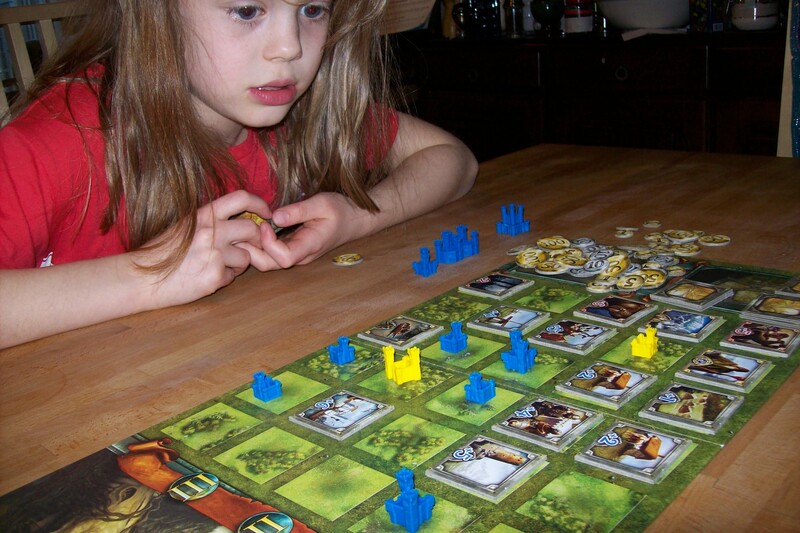 We’ve had a couple of games now and our latest one was a nice, narrow win for Miss B. That’s always good for morale. The game: Hey, That’s My Fish! 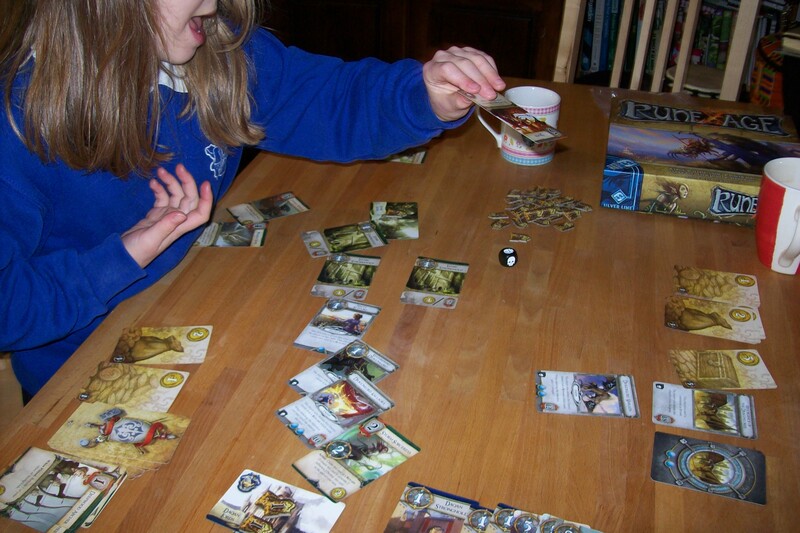 (Fantasy Flight), 2 to 4 games aged 8+. Citadels is probably the most “serious” card game we have played yet. At a basic level it’s about a simple process of building parts of a city, but the real juice comes from selecting the character(s) you want to help you each turn, ranging from a thief or assassin to a bishop or king. Each has their own special ability and you need to balance choices that help you and those that scupper your opponents. Hmm, do I choose the assassin or the thief? The rules are actually straightforward and Miss B quickly got the hang of them. In a two (or three) player game, you get two characters to use each rounds, which I think is probably better than the mainstream rules where you have one, which makes everyone vulnerable to missing a turn. This way, you always have at least one go (though if the other player hits you with both the assassin and the thief it could be pretty miserable). The drafting mechanism for picking characters is great fun and Miss B really enjoyed choosing who was going to help her each time — though in our first game she got massively fixated on the King. Something worth noting is that this, compared to other card games we have played, can be a fairly long game. Our first play was close to an hour (later games have been getting quicker), though it did manage to hold Miss B’s attention very well throughout. We both ended up with good looking cities (the artwork, by the way, is great, though some of the characters are a little grotesque) but I won by quite some margin. A few hours later, Miss B requested a rematch, which is always a good sign. The end scoreline was similar to before, but she managed to stuff me nicely in one turn with neat use of the thief. In fact, we have so far played this a couple more times and, while I have still won each time, it is getting closer and Miss B is growing in cunning and sneakiness. A couple of times she has made impressive use of the thief to stuff me royally, and at least part of that is due to her developing a pretty good feel for the game rather than blind luck. I’m looking forward to more games of this as B comes closer to beating me regularly. I’m already having to think carefully about my choices. What’s the red thing on his neck? Back in the late 90’s the German game company Kosmos churned out an impressive range of two player games, which was slightly unusual then, and still is. Dragonheart is a more recent addition to that range, which sounded like a good idea to me. The presentation is, as with the other games I have seen from the range, great, with a gorgeous and striking box, and nicely illustrated cards and board, plus a cute dragon miniature figure. Once I’d got past all that it quickly became apparent that the theme (the forces of light and dark doing battle to decide the fate of a petrified dragon) is entirely superficial: you just lay down cards in a kind of serial game of advanced rock-paper-scissors. The rules explained the mechanics just fine but left me with no real feel as to how to approach game play. That troll had better look out for knights! Miss B, of course is not worried about such niceties as strategy and quickly embraced the whole concept of playing a fire dragon to grab the treasure, or three huntress cards to shoot down the fire dragon. 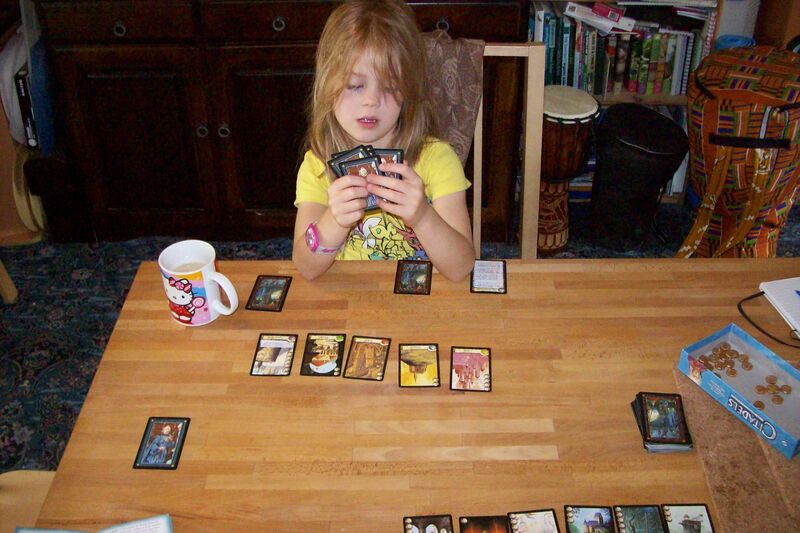 The pictures provide enough theme for her to start imagining the stories going on behind the game play. This is a game that actually feels harder to explain than to play. Dragonheart just plays insanely smoothly. Most of the rules, which could easily have involved a lot of referring back to the rulebook, are elegantly represented by arrows and rectangles on the board, so there is actually very little to remember. After the first few turns, Miss B was even starting to remind me of the rules. Once we had finished our first game, we instantly had to have another go, and since then the game has found its way onto the regular request list, alongside the likes of Sleeping Queens and Coloretto, which is some achievement. More to the point I think that this is one of a handful of games that, in our little household of three of us, would work well as a quick game between any two of us. We’re definitely pleased with this purchase. 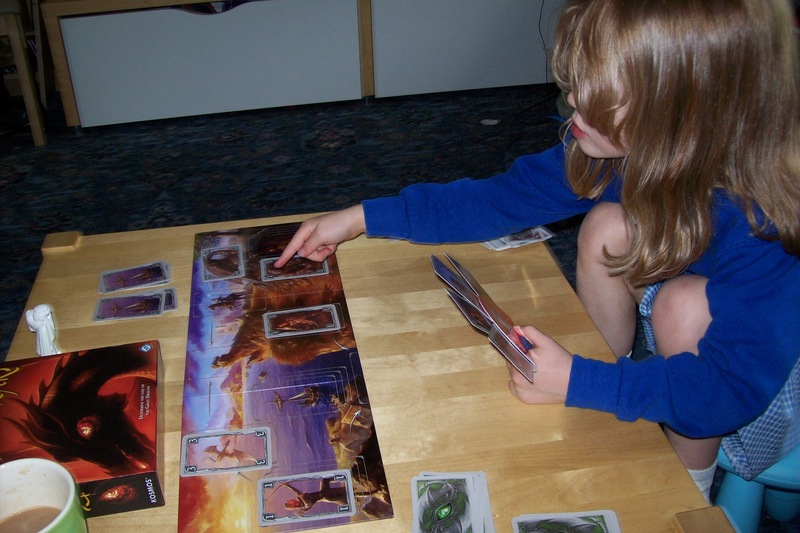 The game: Dragonheart (Kosmos), 2 players aged 13+. Me, wittering on about dragons and stuff, IN COLOUR!